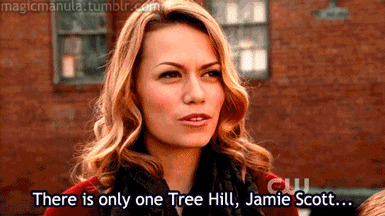 There's only one Tree Hill. Late last semester, I was in desperate need of a new Netflix show to start watching. I casually inquired to my roommates if I should start watching "One Tree Hill." Both having watched the show before, and slightly horrified that I've never even seen a single episode, they wholeheartedly urged me to begin the emotional journey that is "One Tree Hill." The show is quite a doozy at nine seasons, but I powered through all the ridiculous, melodramatic, and, above all, ups and downs that the multitude of characters experience. I have way too many thoughts concerning this show, but here we go. "One Tree Hill" is definitely a show that gives you some serious feelings, and because of that, I think it's one of the best teen dramas ever made. Lucas, Nathan, Brooke, Peyton, Karen, Keith, Whitey, Jamie, Deb, Mouth, Skills, Clay, Quinn, Millie, Chase, Chris, and even Dan will always have a place in every OTH fan's heart. There is, after all, only one Tree Hill.